Beautiful in every season and with stunning songs to match their stunning plumage, northern cardinals are some of the most highly desirable backyard birds in North America. Fortunately for both novice and experienced birders, anyone can attract cardinals if they have the right feeders, bird baths, and nesting areas. With their brilliant red plumage, northern cardinals are easy to see and recognize, and even the more subdued females have lovely red highlights in their fawn-colored feathers. Because these birds do not typically migrate, they can be welcome guests in yards throughout the year. Cardinals are often stunning decorations in otherwise bare winter trees and bushes, since these birds keep their brilliant color year-round. Both male and female cardinals sing varied songs, adding a beautiful voice to their beautiful appearance, and giving birders one more reason to want to attract cardinals. The basics of attracting birds apply to attracting cardinals: yards and gardens that provide the proper food, water, shelter, and nesting sites will be favored habitats for these birds. Food: The northern cardinal's strong, thick bill is perfect for large seeds, and black oil sunflower seeds and safflower seeds are two of their favorites. Other foods cardinals prefer include cracked corn, peanut pieces, fresh berries, apple chunks, and small pieces, crumbles, or shreds of suet. These foods should be offered in large, wide feeders with plenty of space for birds to perch, since small tube feeders are unsuitable for cardinals unless they have a large tray at the bottom. Platform feeders and large hopper feeders are good choices, but avoid lightweight hanging feeders that only have narrow perches. Water: Northern cardinals readily visit bird baths for bathing and drinking, and because they are larger songbirds, slightly deeper baths (2-3 inches at the deepest point) can be suitable. Adding a dripper or mister to the bath will help attract cardinals' attention to this welcome water source. Because these birds remain in northern areas year-round, heated bird baths are essential for winter water. Placing bird baths on the ground is also a good idea, as many cardinals forage on the ground and will stop at the bath for a quick drink. Shelter: Cardinals may have bright plumage, but they prefer discreet, secluded areas for shelter. Thickets of dense vines and shrubs will provide good cover so the birds feel safe and secure. Some of their preferred plants include sumac, mulberry, and blueberry, all of which serve double duty as natural food sources. Plant cardinal-friendly landscaping in varied layers to provide thick cover at different heights up to 15-20 feet tall. Be sure to include evergreen trees and shrubs such as pines and spruces to provide comfortable winter shelter. Nesting Sites: Just as they prefer thick shelter, cardinals also prefer thick cover for nesting. Grapevines, clematis, hawthorn, and dogwood plantings are the best choices for nest sites, as are shrub thickets. Providing nesting material such as small twigs, pine needles, and grass clippings will encourage cardinals to build nests nearby, though they will not use birdhouses. Nests are not reused but a cardinal pair may raise several broods each year, so providing several pockets of dense cover for nesting can encourage the family to stay nearby each time. While northern cardinals can be relatively easy to attract, even the best yard may be overlooked by these beautiful birds. If you have trouble attracting cardinals, there are additional steps you can take to make your yard more cardinal-friendly. Choose larger, heavier feeders that will not sway, or place feeders on sturdy poles rather than hanging them to provide more stability when cardinals are feeding. Positioning feeders out of strong winds can also help keep them stable. Place a tray or platform beneath hanging feeders or feeders with narrow perches to provide better space for these large songbirds to feed. Leaving fallen seed on the ground for a few days can also encourage ground-feeding cardinals to visit. Ensure feeders are filled early in the morning and late in the evening, as these birds are often the first and last to visit feeders each day. If there is no food available when cardinals arrive, they may leave and not return. Keep feeders filled even during the stormiest winter days. Because cardinals stay in the same range year-round, they will become accustomed to a reliable food source. A good winter food source can even attract a radiance or Vatican, fun names for a whole flock of cardinals. Leave high, open branches on trees to provide perching space for singing cardinals, particularly during the spring and early summer when breeding season begins. This will let the birds claim territory and attract mates much more successfully. Covering reflective surfaces such as glaring windows, car mirrors, and chrome equipment that could distract cardinals. These birds will attack their own reflections, and doing so causes excessive stress that may make the birds seek another yard to frequent. 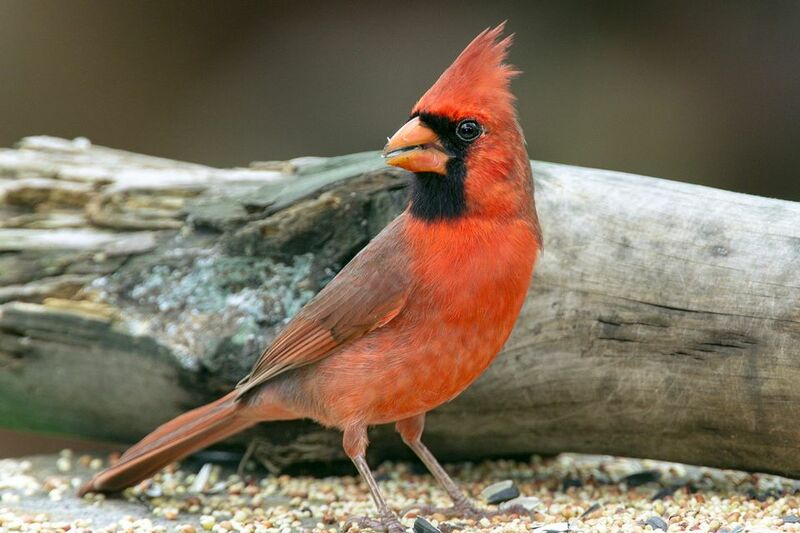 By meeting all the northern cardinal's needs for the best food, freshest water, and most secure shelter and nesting sites, you can attract these lovely red birds to your yard and enjoy their company all year round.